The Spring/Summer 2013 collections bore witness to a seemingly endless procession of newcomers stalking fashion's runways in search of a moment in the spotlight. One model who garnered a lion's lair of attention from casting directors, designers and model aficionados was the striking Canadian Kayley Chabot. The Alberta native pierced through the haze of newcomers with her uncanny resemblance to Twilight actress Kristen Stewart, appearing at Calvin Klein, Alexander Wang, Altuzarra, Proenza Schouler, Valentino and Max Mara amongst others. Fashion pundits may be going gaga over Chabot's modern take on beauty however it is the sixteen year old's professionalism, maturity beyond her years, and effervescent personality that is truly earning her accolades left, right and centre. 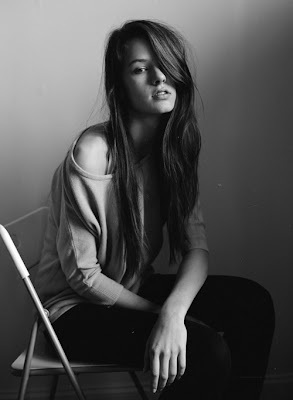 Sixteen year old Chabot was discovered three years ago at an open call held by her mother agency Mode Models. 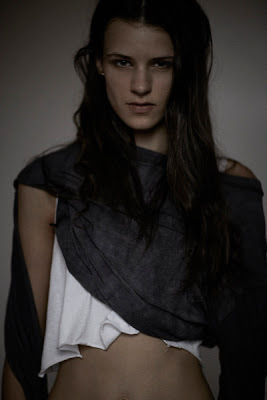 Chabot's modelling career kicked into overdrive when Ford Models' Paul Rowland noticed the lanky, 180 cm tall beauty on Mode's agency website and summoned her to New York before signing her to Ford Model Management's roster of beauties. I encountered Chabot during the castings for Oscar de la Renta in New York in September and was intrigued by the overall package that she presents. Chabot is a standout beauty with a distinctly recognisable curled upper lip, strong jaw-line, and a milky, translucent complexion offset by illuminating green eyes and cascading auburn tresses. Chabot's extraordinary beauty is clearly discernible to all in her midst, however it is her upbeat personality, eagerness to please and genuinely sweet nature which will surely galvanise the industry's continued interest in seasons ahead. Inoubliable Model Army caught up with Chabot to discuss her perfectionist tendencies, the hazards of extension glue caught in hair, and the harsh realities of modelling. 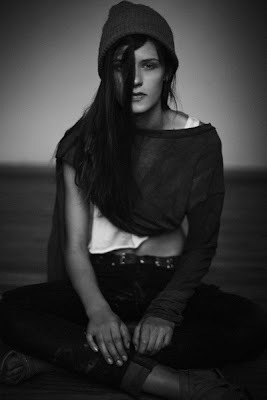 Inoubliable Model Army: Congrats Kayley on your stunning Spring/Summer 2013 debut. How are you feeling and are there any any highlights that spring to mind? KC: I'm really happy with how things have been going. I loved all the travelling during fashion week. Every week I was in a different country experiencing things that I never thought I would have the privilege of doing! Inoubliable Model Army: You started modelling quite young. How did you cope with starting out in the industry at such an early age and how do you juggle modelling with schooling commitments? KC: In the beginning, it was just a fun thing to do. I learned a lot and I am still learning something new about the industry every day. One of the best coping mechanisms I learned is having a strong sense of self. I learned not to compare myself to other girls and to just take it day by day and enjoy every minute of it! I'm currently doing schooling online. Inoubliable Model Army: What are your thoughts on the CFDA's banning of the use of models under the age of 16 in runway shows? KC: I think it's a really good move on their part. I know that when I was 13 or 14, I would definitely not have been ready. It allows extra time for development for young girls. Inoubliable Model Army: What are the biggest misconceptions about modelling and the modelling industry? KC: Everyone thinks it's so glamourous! But what they don't realise is that running on zero sleep, extension glue stuck in your hair, blistered feet and getting skin breakouts from all the make-up is SO not glamourous! We have long nights, early mornings and the pressure to still look our best! It's crazy, but I love it. Inoubliable Model Army: How was it coming into the shows as a complete newbie and did you have the chance to bond with any other models throughout the show season? KC: At first I was really intimidated being one of the new girls, but after a while I realised that we're all in the same vote. I've met so many amazing girls, most of my best friends are in New York now! Inoubliable Model Army: What are your plans following the Spring/Summer 2013 season? What are your hopes for the future and do you have in dream assignments on your bucket list? KC: I plan to hopefully continue on the path I'm on with modelling and to enjoy every minute of it. I never know what's next, there's something new every day. Italian Vogue is on the top of my list as far as dream assignments go. Inoubliable Model Army: What are you modelling likes and dislikes? KC: I love the travelling and meeting so many amazing people. It's a dream to me, However, being away from my family and friends for long periods of time is hard some times. I miss them a lot! Inoubliable Model Army: What has been the highlight of your modelling career so far and why? KC: Fashion Week in general. It was beyond anything I could have ever imagined. Inoubliable Model Army: What makes you Inoubliable (Unforgettable)? KC: I think what makes me Inoubliable is my desire to succeed and to please others. I work very hard with everything I do. I'm also a perfectionist. I'm a Virgo, I can't help it!